Here we have this wonderfully colorful window, with eight saints subscribed with their names (in Latin, of course). 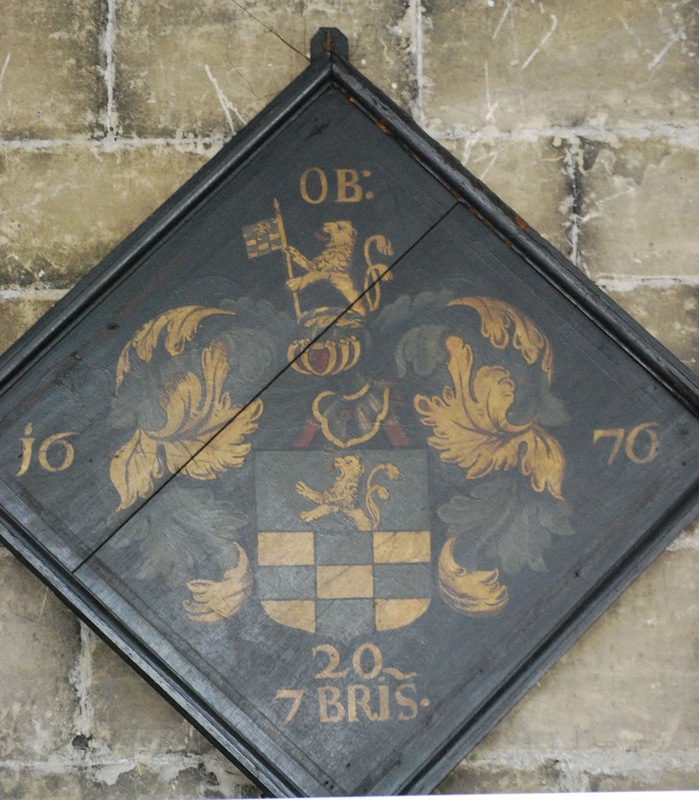 And here is a detail of the armorial panel at the bottom. The two left panes contain monograms. 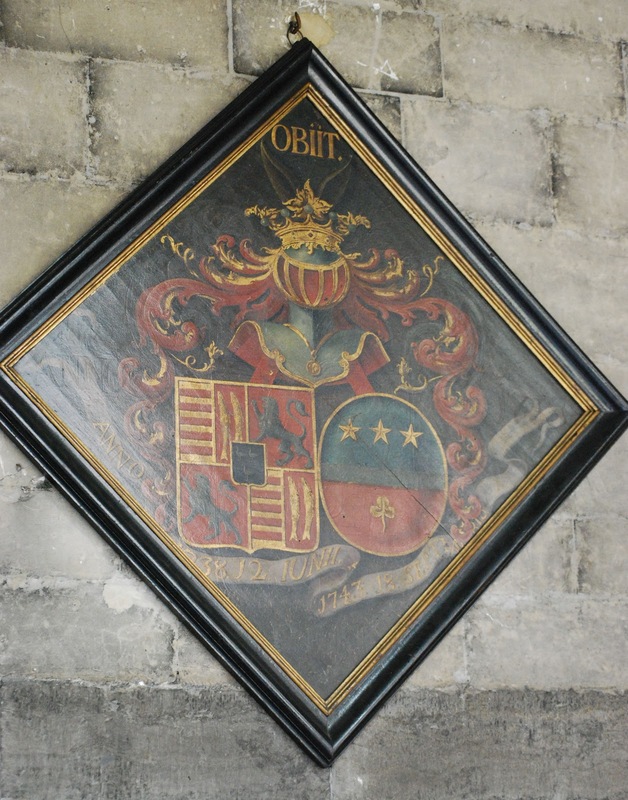 The third pane contains the arms of Villers, blazoned in Rietstap's Armorial Général as: De gu. à trois estoiles d’or, entre deux cotices du mème. An English blazon would be: Gules, three mullets of six points between two bendlets Or. 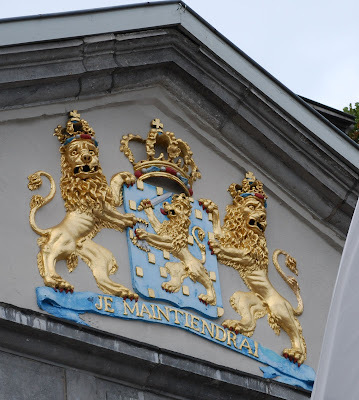 As you can see, though, the window makes the charges argent, white, and not gold or yellow. The second window for today is not as tall, and depicts four female saints. The armorial panel at the bottom bears two coats of arms, each repeated. 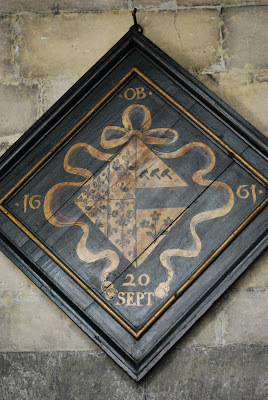 I haven't had the time (see "looking forward to retirement," above) to track down the arms in the first and third panes. 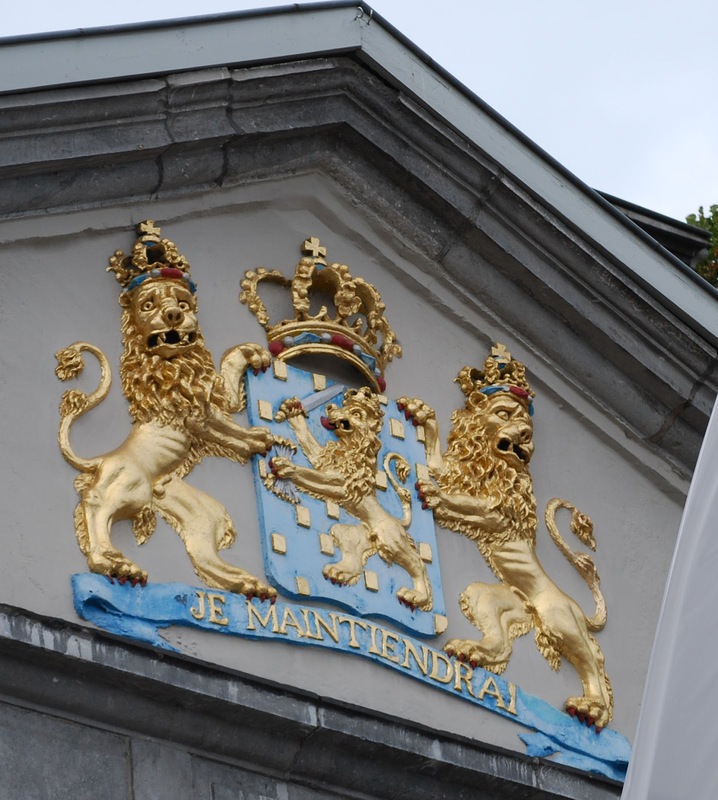 An attempt at blazoning them might result in: Or, two bars wavy Azure alternating with two bars Gules. 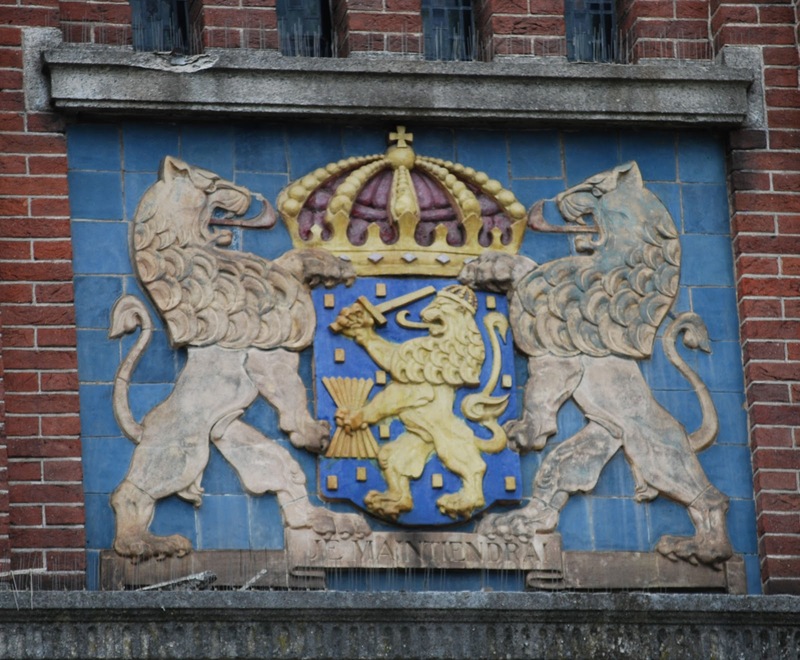 The second and fourth panes contain the arms of South Holland: Or, a lion rampant Gules armed and langued Azure. 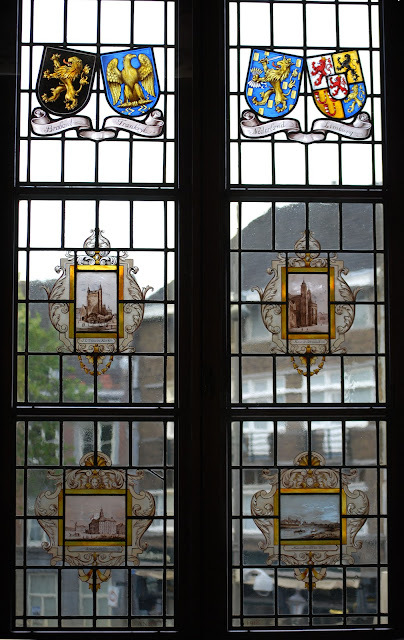 What beautiful examples of the glass stainers skill and armorial art! 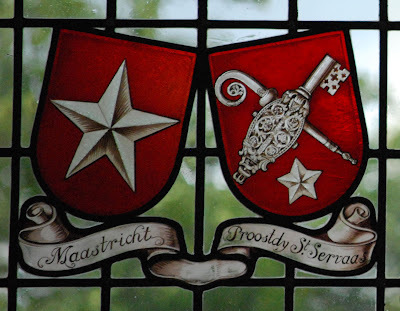 Continuing our heraldic tour of the Basilica of St. Servatius in Maastricht, we come to the heart of the basilica, as it were. 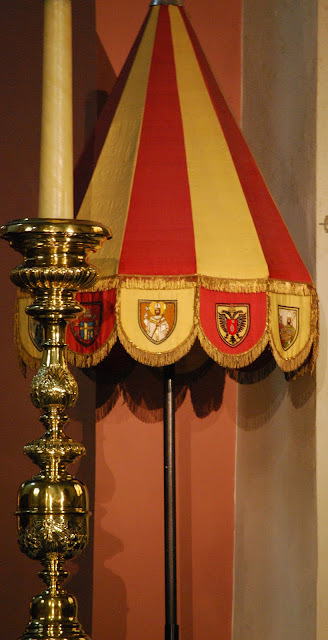 While cathedrals always have a cathedra, the chair of the bishop, basilicas have an ombrellino, an ecclesiastical umbrella. And this is the one which marks this basilica as such. 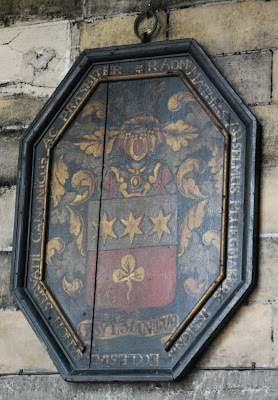 And here is a detail, showing the heraldry emblazoned upon it. 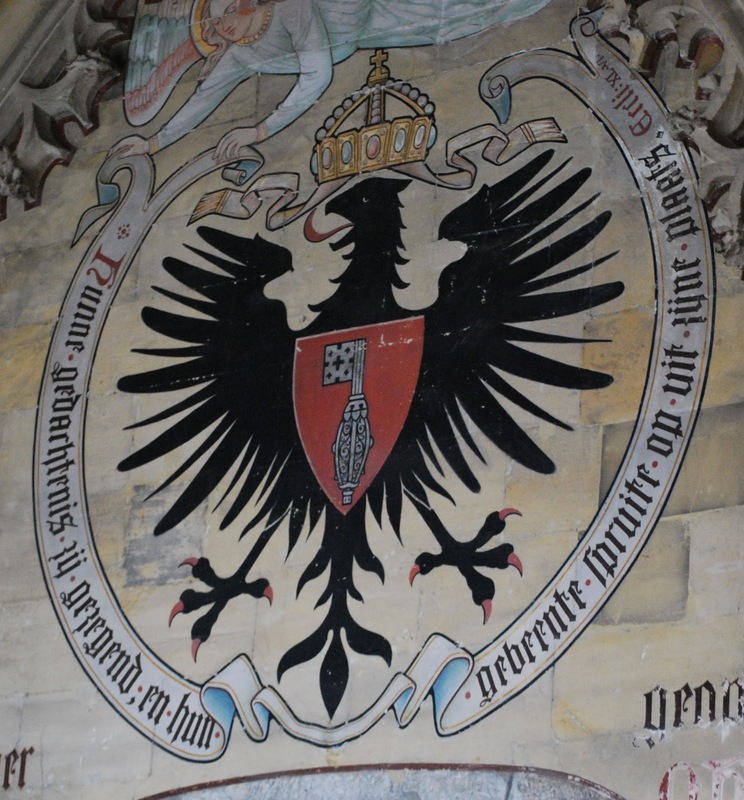 The coat of arms on the red panel to the right are, of course, the arms of the Basilica itself, supported by a double-headed eagle. 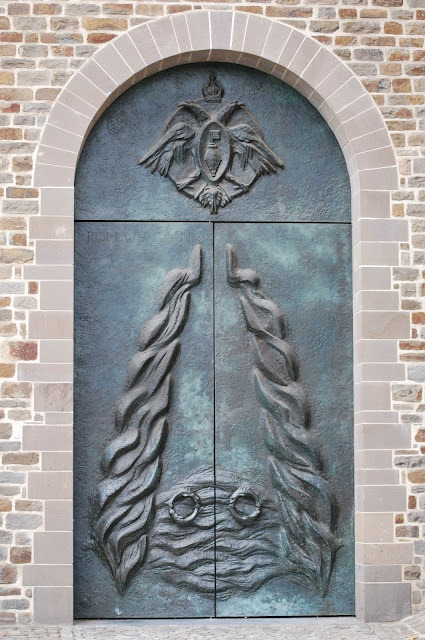 The coat of arms on the red panel to the left are the well-known arms of Pope John Paul II, a blue shield with an offset gold cross, and a gold letter M which he adopted for his devotion to the Virgin Mary. 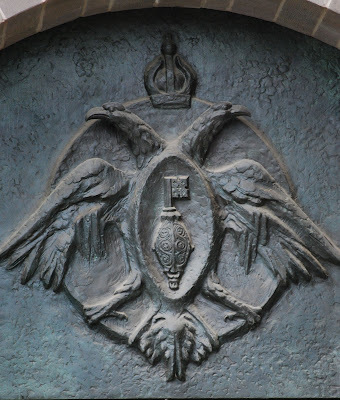 The arms have the crossed keys of St. Peter behind the shield, with the papal tiara above it. 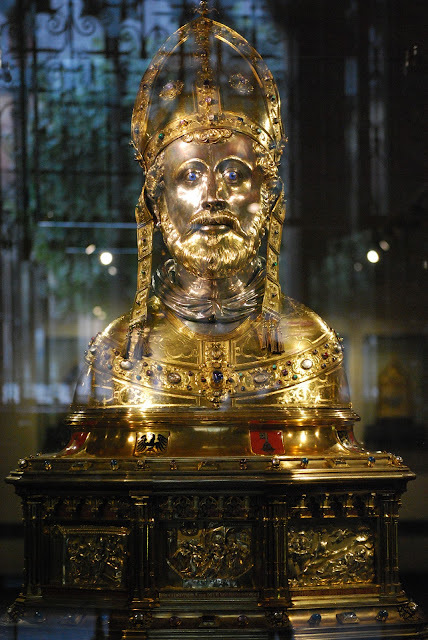 One of the real treasures contained in the Treasury at Basilica of St. Servatius is a gilded bust, dating to 1580, containing a relic of the Saint's skull. 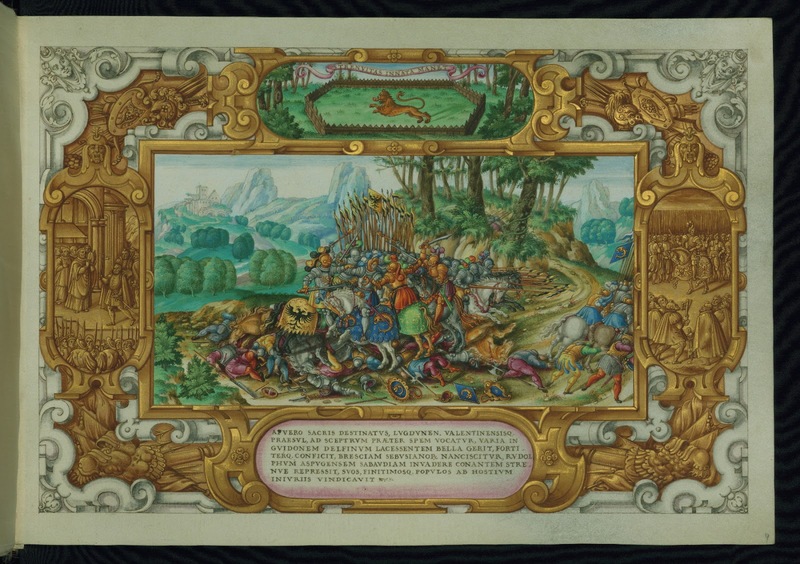 As you can see, it is a beautiful piece of work. But, of course, the part that most attracted me was the enameled coats of arms encircling it between the bust of the saint and the casket the bust is mounted on. 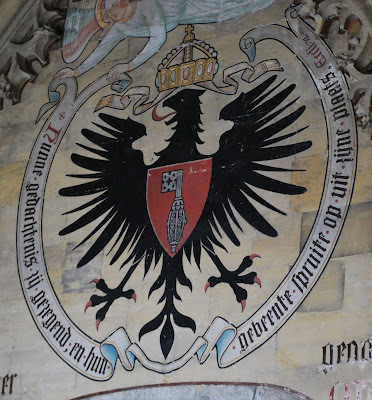 The photo above is of the front of the reliquary, and has the arms, from left to right, of Liège, the early arms of the Holy Roman Empire (the eagle was single-headed until 1440, after which time it was double-headed), St. Servatius, and what I believe are an early form of the arms of the Province of Limburg. 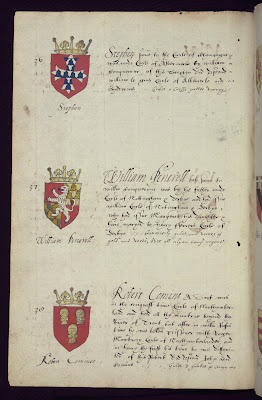 Certainly the second and third quarters, the upper right and lower left on the shield, match the arms of the Belgian Province of Limburg, and also match the first quarter and the inescutcheon of the modern arms of the Dutch Province of Limburg. This photo is taken of the back, and has the arms, from left to right, of Bavaria, arms which I have not had the time to research properly to determine which entity it represents (Argent a cross sable. 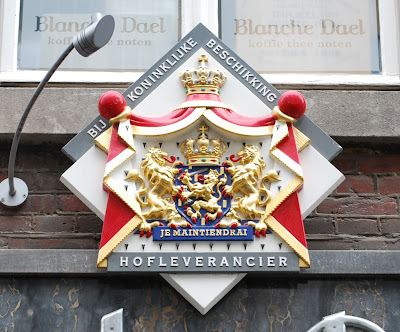 Do you have any idea how many plain crosses there are in European heraldry? Or even just how many black crosses on white shields there are? Lots! 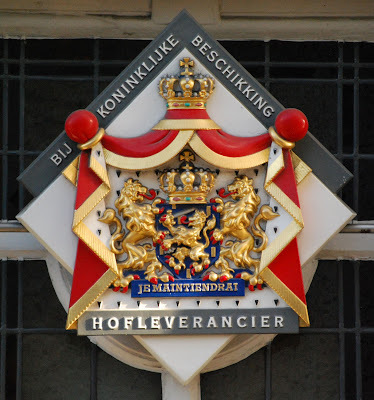 ), another portion of the Province of Limburg (this shield appears in the second quarter of the modern arms of the Dutch Province of Limburg), and France. These next two photos were taken from the dexter (the reliquary’s right side) and sinister (the reliquary’s left side), respectively. 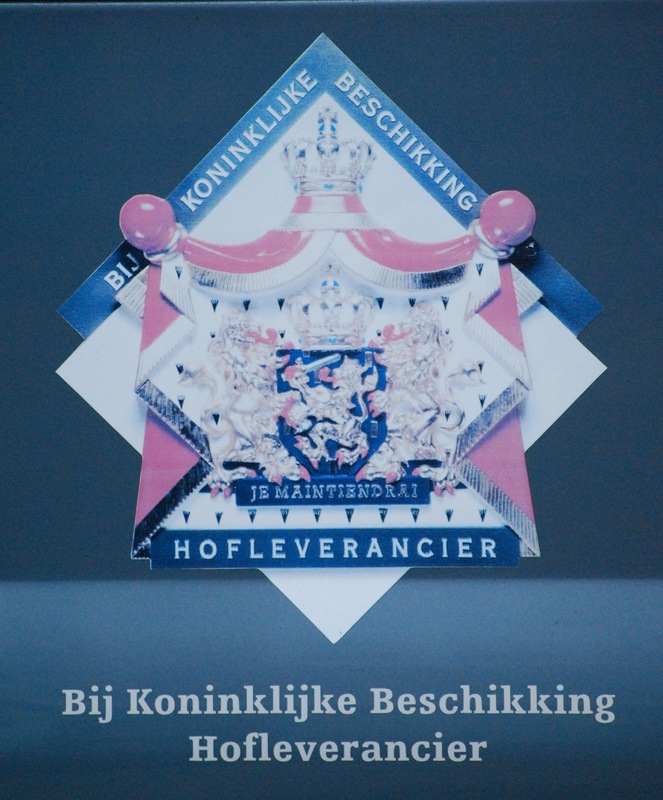 Isn’t it a remarkable work? 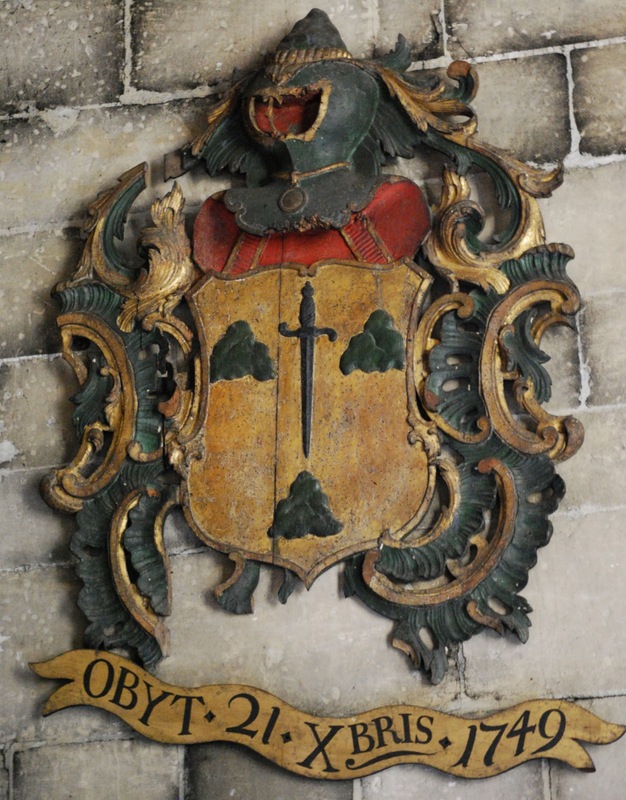 And what great heraldry, too! 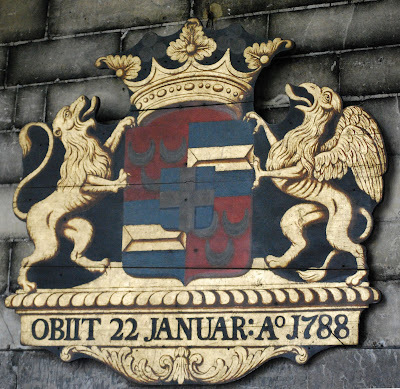 And here’s a close-up of the arms there. 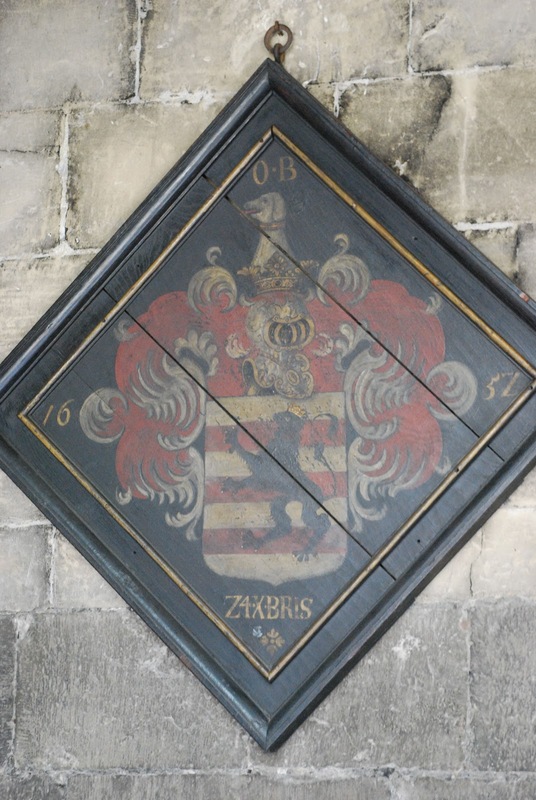 The arms were also painted on a wall inside, over another doorway. 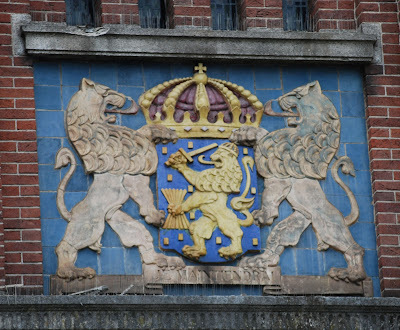 One of the things that I like about traveling outside the United States is that you can often see representations of the national arms (which are often the arms of the reigning king or queen, in nations which are monarchies). I mean, I can occasionally find the arms of the United States depicted here and there - mostly on courthouses and post offices - but not to the extent that one can find elsewhere. So what follows here are some of the depictions of the arms of The Netherlands/Queen of The Netherlands that I saw in Maastricht. 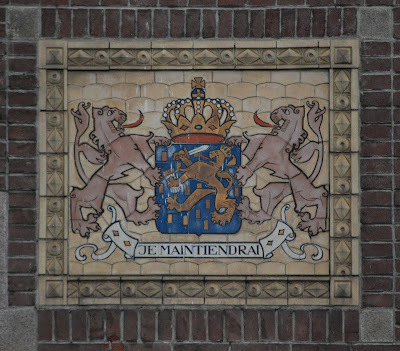 The first three were found as the Dutch version of the display of the British Royal arms that can be found on various shops, etc. around England and Scotland, “By appointment to,” “purveyors of.” These three are from, in order of descent, a whisky shop (which also had a large Scottish saltire flag flying out front, though I noticed that they had a number of non-Scottish whiskies, including some American), the panel van of a liquor store chain (BAMS slijterijen), and on a shop, Blanche Dael, selling “coffee, tea, nuts” (koffie thee noten). 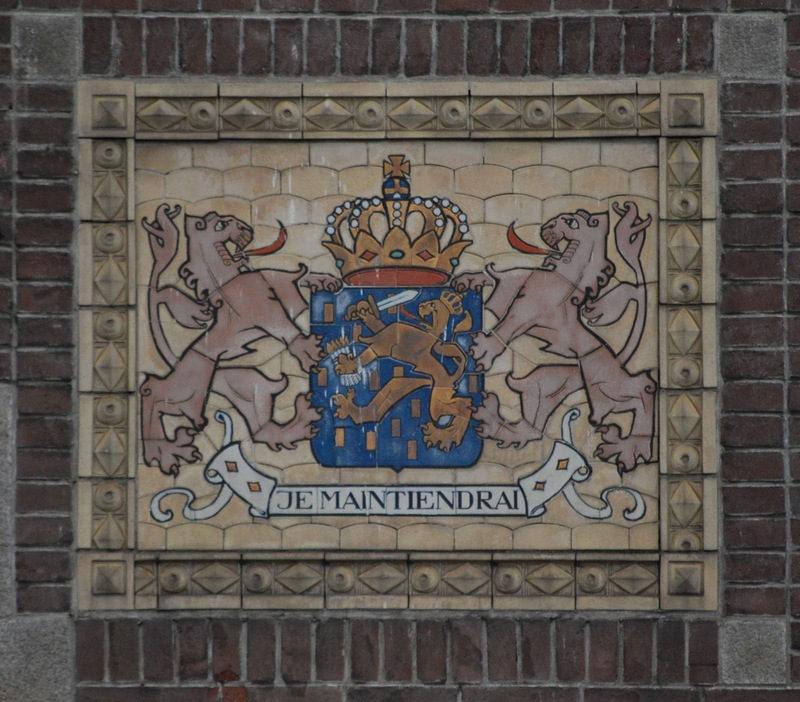 This next depiction of the Royal arms comes from the pediment of what I was told was the old armory, now the Theater aan het Vrijthof, facing Vrijthof Square. 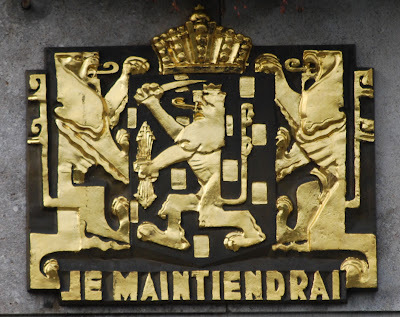 Next is a very Art Deco variant of the Royal arms, found on the facade of the Hotel du Casque. This rendition of the Royal arms was found on the exterior of the train station. And, last but certainly not least, this version was found on the Post and Telegraph (Post en Telegraaf) building. The Walters Art Museum of Baltimore, Maryland, has been digitizing some of its holdings and making them available on-line. And, perhaps unsurprisingly, some of these holdings are heraldic. 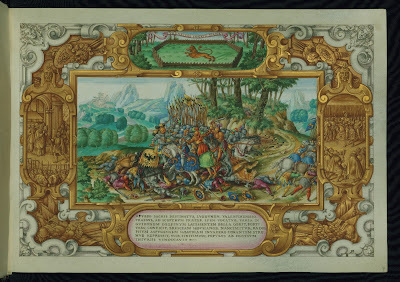 The books below, and all of their other books, can be found in a listing on their website at http://www.thedigitalwalters.org/01_ACCESS_WALTERS_MANUSCRIPTS.html All of these books can be read on-line, or you can download and save some or all of their pages in varying resolutions and in two different formats, .tif and .jpg. 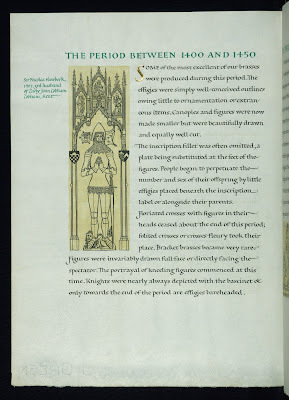 There are, of course, a lot of other manuscripts and books there, ranging from single leaves to entire books, but these are the heraldic ones that jumped out at me, and I just had to share them with you. 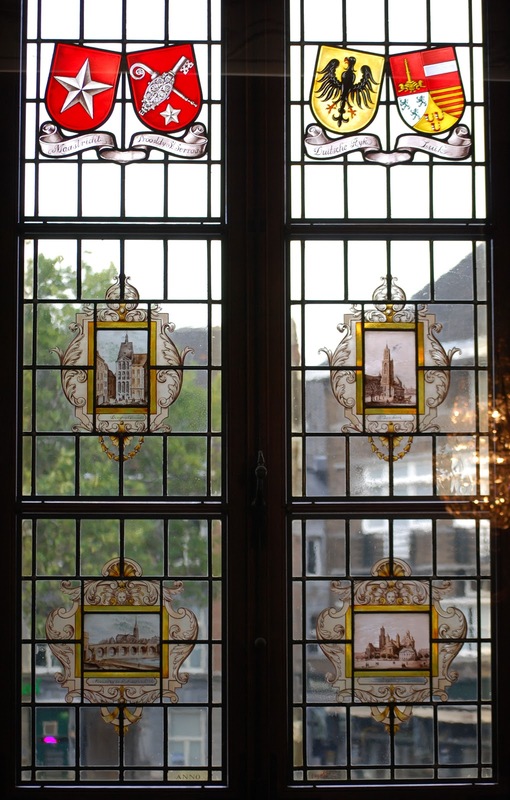 This window contains (across the top, from left to right) the arms of the Duchy of Brabant, Napoleonic France, The Netherlands, and the Dutch Province of Limburg. Below these are depictions of two of the churches in the city, and beneath those are a depiction of the Stadhuis and a view of Maastricht in 1850. The second window contains (across the top, from left to right) the arms of the City of Maastricht, the Basilica of St. Servatius (in Dutch, St. Servaas. Born about 310 and dying in 384, he was the first bishop of Maastricht. ), Germany, and the Province of Liège (which itself is a combination of the arms of the Cityh of Liège, the Duchy of Bouillon, and the Counties of Franchmont, Loon, and Horne). Below the arms are depictions of a building (the Dinghuis) and a church (Janskerk), beneath which are a view of the city and bridge over the River Maas and another church (I can't quite make out the name). But what a beautiful pair of windows, proudly displaying coats of arms important to the region as well as civic pride in the churches, buildings, and views of the city!